Welcome October! And the golden maple trees, the chill in the air, football, apple cider and donuts....all the things I miss from my Michigan years. Yes, we get fall in South Florida too, but you have to look very carefully. No cool temps to alert you, at least not until November or sometimes even December. So I live vicariously through all of you and search for apple and pumpkin recipes, hoping they will make me feel like it's October. Difficult when it's 90 degrees outside! This recipe is my first pumpkin recipe since last fall. The ingredient list makes it look more involved than it really is and the results are well worth the little bit of fuss. Besides, it didn't take much time at all. Haven't made a poke cake since something lemony that was all the rage years ago, so this was fun. Such a moist pumpkin cake to begin with and then you add that marvelous warm cinnamon-vanilla custard. Ah yes, the house smelled like fall while this was baking! For the cake: make a foil sling for an 8-inch square pan: cut two 16-inch lengths of foil and fold them to widths of 5 inches each. Fit foil pieces into baking dish, one overlapping the other, pushing them into corners and up sides of pan; allow excess to overhang pan edges. Cut two more pieces of the same size and arrange them in the same way, except perpendicular to the first two. This creates a sling that will help you remove the cake after baking and cooling. Spray foil lightly with nonstick cooking spray. Combine the oats, pumpkin puree, and water in medium bowl and let sit until water is absorbed, about 5 minutes. In a medium bowl, whisk the flour, baking soda, baking powder, salt, cinnamon, and nutmeg together. In a large bowl, cream together the butter and sugars for a few minutes until the mixture resembles damp sand. Add the egg and vanilla and mix until combined. Add the flour mixture in 2 batches, mixing until just incorporated after each addition. Add the oat mixture and mix until just combined. Stir the mixture by hand to make sure everything is combined. Pour the batter into the prepared pan and tap it against the counter a few times remove any air bubbles. Smooth the surface with a spatula. Bake the cake, rotating halfway through baking, until a toothpick inserted into center comes out with few moist crumbs attached, about 28 to 32 minutes. Let the cake cool in the pan for about 10 minutes while you make the custard. Method for the custard: Melt the butter in a skillet over medium heat. Remove from the heat and stir in the flour until it’s blended. Add the milk and then return to the heat, stirring as you add the sugar. Continue stirring, bringing the mixture to a boil and boiling for about a minute. Remove from the heat and add vanilla, cinnamon, and cardamom. Let the mixture cool for a few minutes as you use the handle of a wooden spoon to poke holes every inch or so over the cake. Pour the warm custard over the cake evenly. Let the cake continue to cool while you make the icing. Method for the icing: Move the oven rack to around 9 inches away from the broiler heating element and preheat the broiler. In a medium bowl, whisk together the brown sugar, cinnamon, melted butter, and milk. Stir in the coconut and pecans before spreading the mixture evenly over the top of the cake. (It reminds me of the German Chocolate Cake Frosting) Broil the cake, keeping a close eye on it and rotating as needed, until topping is bubbling and golden, about 3 to 5 minutes. Let the cake cool in pan until it’s cool enough to pop into the fridge. Chill it for at least 2 hours before serving. Use the sling to pull the cake gently out of the pan. 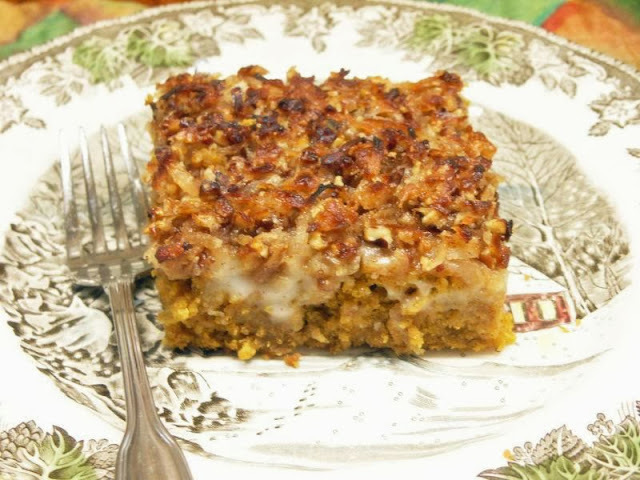 Cut it into squares and transfer to a platter or serving plates. You can heat each serving for 30 seconds to a minute in the microwave before serving to remove the chill. *Cooks notes: Do not use old-fashioned or instant oats for this recipe. Be sure to use a metal baking dish. You'll find a vertical sawing motion with a serrated knife works best for cutting through the crunchy icing and tender crumb. 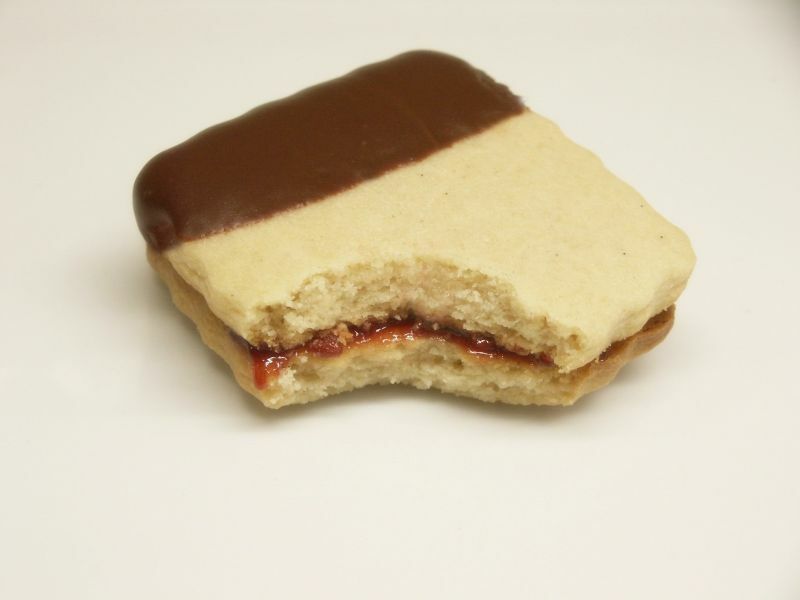 Do you remember a while back I posted Peanut Butter and Jam Cookies? I mentioned I had bookmarked two cookie recipes from Pastry Studio and here's the second. 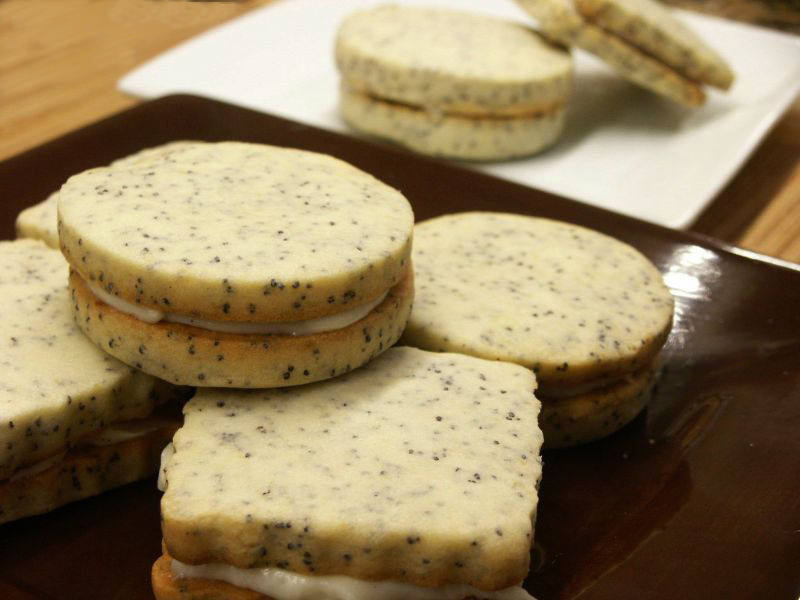 Nothing tastier than a lemony poppy seed cookie. And the cream cheese filling is delicious, snuggled between the cookies. Both these recipes are going to be such a hit when I serve them. Not saving these for Christmas! These glamour cookies are going on my tea table in October. Gayle from Pastry Studio has a eCookbook out for Kindle (and other androids). For information and link click HERE. In a food processor, place the flour, confectioner's sugar, poppy seeds, salt and lemon zest and process to combine. Cut the cold butter into 1/2" cubes and add to the flour mixture. Process 10 - 15 seconds. Combine the egg and vanilla and pour over the mixture. Process about 15 seconds until the dough starts to clump around the center of the machine. Divide the dough in half. Place half of the dough on a piece of plastic wrap. Cover with another piece of plastic wrap and roll out to a circle 9 1/4" in diameter. Slide onto a sheet pan and refrigerate until completely chilled. Repeat with the other half of the cookie dough. Huh. A complicated title for a savory bread, isn't it? The French often call bread a cake. And it also appears they like to place nearly all the ingredients in the title. :) The recipe was found at Cuisine de Provence and Barbara discovered it in a cookbook about the cuisines of B & B's in Provence. 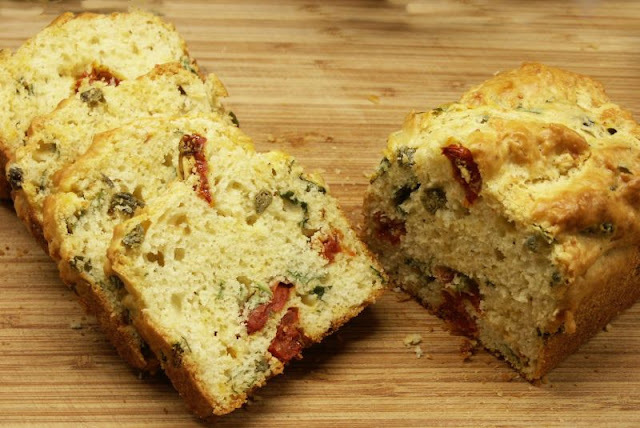 Savory breads are fun and quick to make; this one is too. Love them with soups or salads, don't you? Butter two small loaf pans and then sprinkle with dried bread crumbs. Mix all ingredients except for the tomatoes, capers and basil into a smooth dough. You can do this by hand, easily. Add the remaining ingredients and fill the loaf pans. Cool in the pan and then on a rack. Arrange the tomatoes on a sheet pan, cut sides up, in a single layer. Drizzle with olive oil and the balsamic vinegar. Sprinkle with the sugar, some salt and freshly ground black pepper. Roast for 1 1/2 to 2 hours until the tomatoes are concentrated and begin to caramelize. Allow the tomatoes to cool to room temperature. Dawn from Vanilla Sugar Blog has an obsession with crumb cakes. Lucky for us. 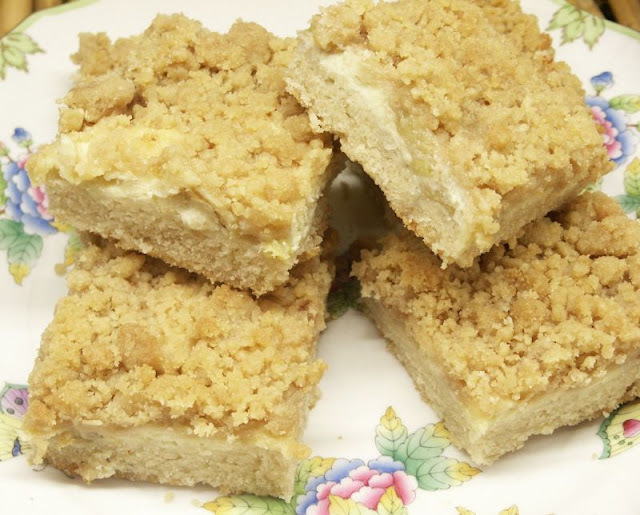 Her Banana Cream Crumb Cake photos in a recent post made them hard, no, impossible, to resist. Banana Cream pie is one of my favorites and here it is in crumb cake form. Dawn poured some rum on those bananas too, just to make them even more delectable. Yes, there are several layers, but if you organize it right, it doesn't take all that much time to put together. Here's a quandary: is this a bar or a cake? Looks like a bar, sort of tastes like a cake. You decide when you make them. I vote for bar. However, the surprise is definitely the cake-base. We're so used to a firm cookie base with our bar recipes, that this base really surprised me. It rises in the pan and nearly overtakes the bar. Dawn said the cake to crumb ratio was literally 40% cake and 60% crumb. Mine, as you can see in the photo, seemed to be pretty much even cake to crumb. But what we loved were the flavors in between! Rummy bananas (and I mean that in the best possible way) and cream cheese. Instead of layering them, Dawn made alternating stripes of each over the base. 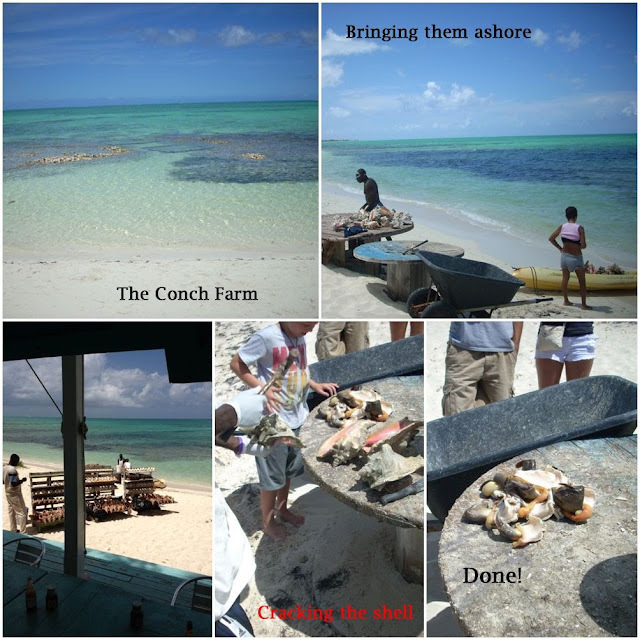 (Really good step by step photos on her post.) No reason you couldn't layer, but the stripe idea was simple enough and every square you cut does have some banana and cream cheese in the center. Not a lot, but enough. I might actually like a wee bit more myself, but then I do like rummy bananas. :) I mean, who doesn't? In a medium bowl, combine all dry ingredients, pour melted butter over mixture, and toss with a rubber spatula until large crumbs form. Set aside. Chop up the bananas into half inch pieces. Over medium heat, heat up the 2 TB of butter, Sautee the bananas until they get a little brown; then add in a dash or two of rum. If you’re comfortable with flambé then go ahead and do so, if not, then just cook the rum out about 3-4 minutes. Take off heat. Mix all in a bowl (really well) until ready to use. Set aside. Place rack in center of oven, and heat oven to 350°. Lightly butter a 9 x 13 baking pan and dust with flour, and tap to remove excess. ( I always use bread crumbs over the butter instead of flour a la Maida Heatter but Dawn also said she's used the Pam with Flour and it worked just fine). Set aside. In a medium bowl, sift together 2 ¼ cups flour, add in the granulated sugar, baking powder, and salt; set aside. In a second bowl, whisk together egg, butter, half & half, canola oil, and vanilla. Keep in mind this dough is not pourable, not very liquid, more of a dough-like batter. Press batter evenly into prepared pan. The batter should be about half an inch high, it will cook/rise to an inch thick. (The batter spreads out as it’s cooking). Next put on the cream cheese mixture; Dawn did this in vertical lines in the pan. And on the other sides of these lines she added on the banana mixture. If you want swirls and no lines then apply the topping/ mixtures however you desire. Next add on the crumbs, making sure to cover the whole top. Bake for 14 minutes, rotate pan. Then cook another 5-10 minutes or until a cake tester comes out clean. It is hard to tell when cake is done, but look for golden brown edges. Remember the cake part is thin and does bake up fast. You have to let this set up at least an hour before slicing. Using a serrated knife or bench scraper, cut into 3-inch squares. It does need to be refrigerated, so store in an airtight container for up to 2-3 days. My mother made this often when we were young...and served it with wild game the family brought back from hunting expeditions.....duck, pheasant or quail. She made it with Velveeta (Quelle horreur! Remember, the WWII generation of housewives used Velveeta in everything.) but you can use a nice cheddar. It couldn't be simpler as it merely throws a bunch of ingredients together in a casserole and into the oven it goes. The only thing you have to remember is the soaking overnight and I parboil the rice for 15 or 20 minutes before I throw it together with the other ingredients. 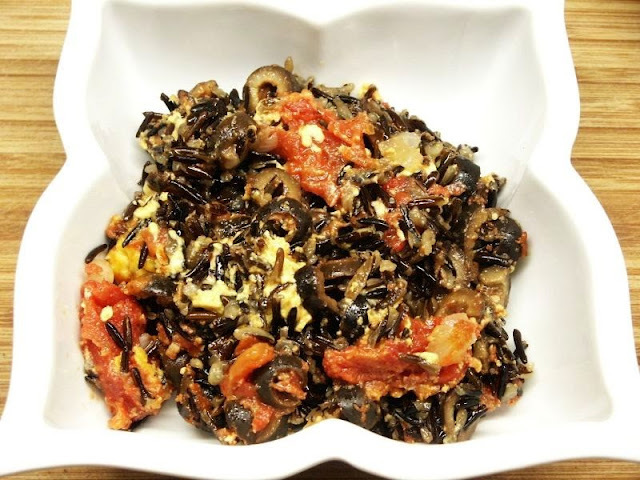 I never used to parboil (and still can't figure out why it was necessary), but perhaps wild rice is processed differently now....at any rate I tried it last fall and the rice didn't cook enough for our taste, so I made a note to cook the rice a bit when I next made it. Easier than baking twice as long. So this is my second, and successful, try. Drain rice well and add water to cover. Parboil about 15 minutes. Drain and pour into casserole; mix in the other ingredients. Bake 375 for 1 hour; if it looks too dry, add some of the reserved fluid. Brown sugar in a panna cotta sounded so caramelly that I was hooked when I read the ingredients for this dessert. Even the title spells fall, doesn't it? I recently watched a Martha Cooks episode and she used brown sugar in her angel food cake and I saved the recipe. 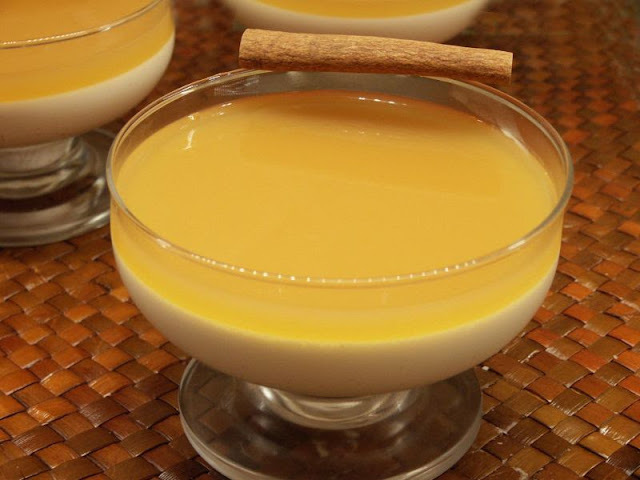 So you can see, I love that brown sugar flavor in everything and since I've had this panna cotta recipe for a while, I decided to try it as soon as I laid eyes on some apple cider. The recipe calls for light brown sugar, which I didn't have, so took a chance with dark brown sugar. So glad I did. It wasn't as strong a flavor as I expected but the color was perfect with the cider gelée. Fun fall dessert and so easy to make. Scrape vanilla seeds from pod into 5-quart saucepan. Add cream, brown sugar, and cinnamon sticks and bring to a simmer over moderate heat. Remove from heat and let steep, uncovered, 20 minutes. Using slotted spoon, remove cinnamon sticks, then let cream cool to room temperature. In small saucepan over moderate heat, place 1 cup cream mixture. Add 2 packages gelatin and whisk until dissolved, about 3 minutes. Whisk mixture into remaining cooled cream. Spoon mixture into 10 wine glasses, leaving a 3/4-inch space at top of each. Chill until firm, about 4 hours. In a medium saucepan heat 1 cup cider until hot, but not boiling. Remove from heat and add remaining package of gelatin, whisking until dissolved, about 2 minutes. In large bowl, stir together cider-gelatin mixture and remaining 1 1/2 cups cider. Cool to room temperature. 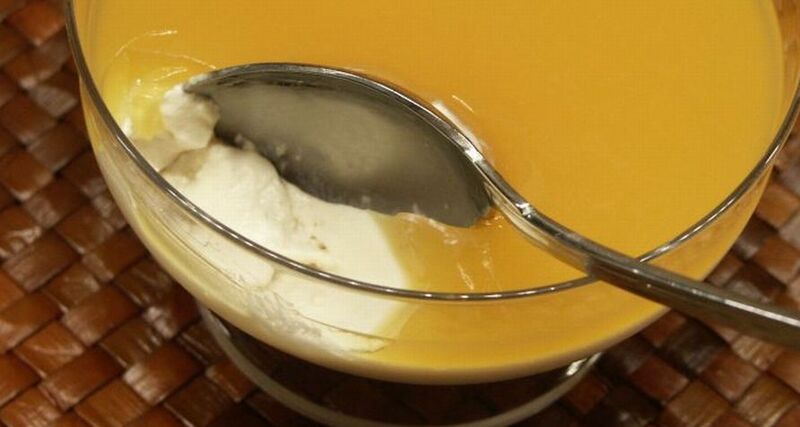 When custards are firm, spoon 4 tablespoons cider mixture into each wine glass. Return to refrigerator and chill until firm, about 1 hour. Congratulations! You officially own a funky tee shirt! 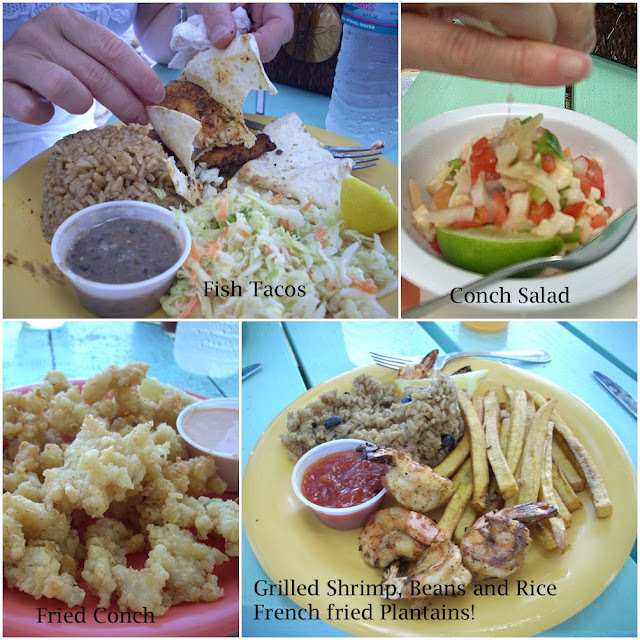 A great way to spend an afternoon, but we came for conch! 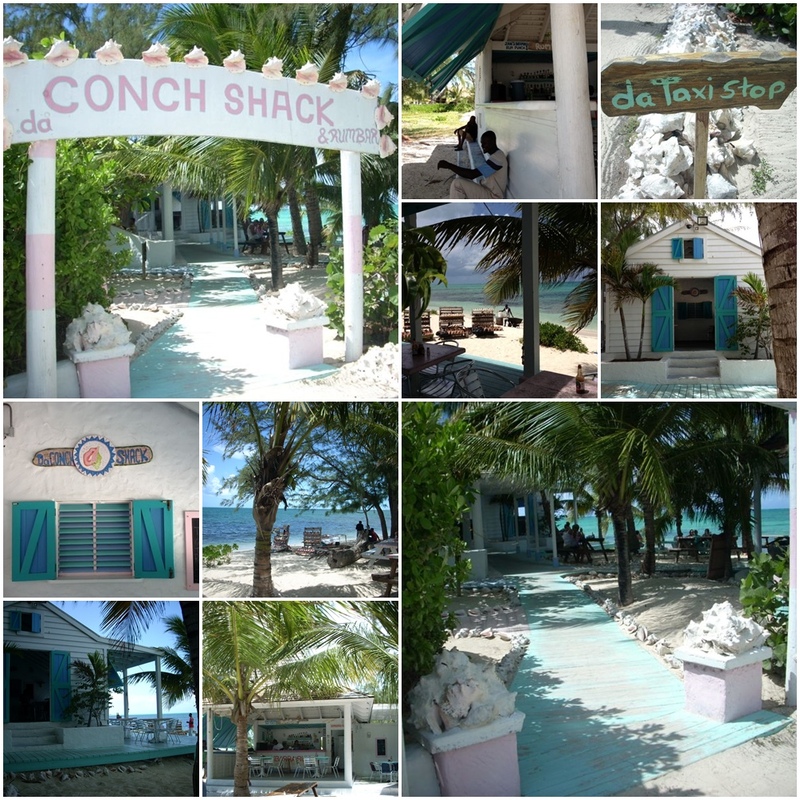 The location? 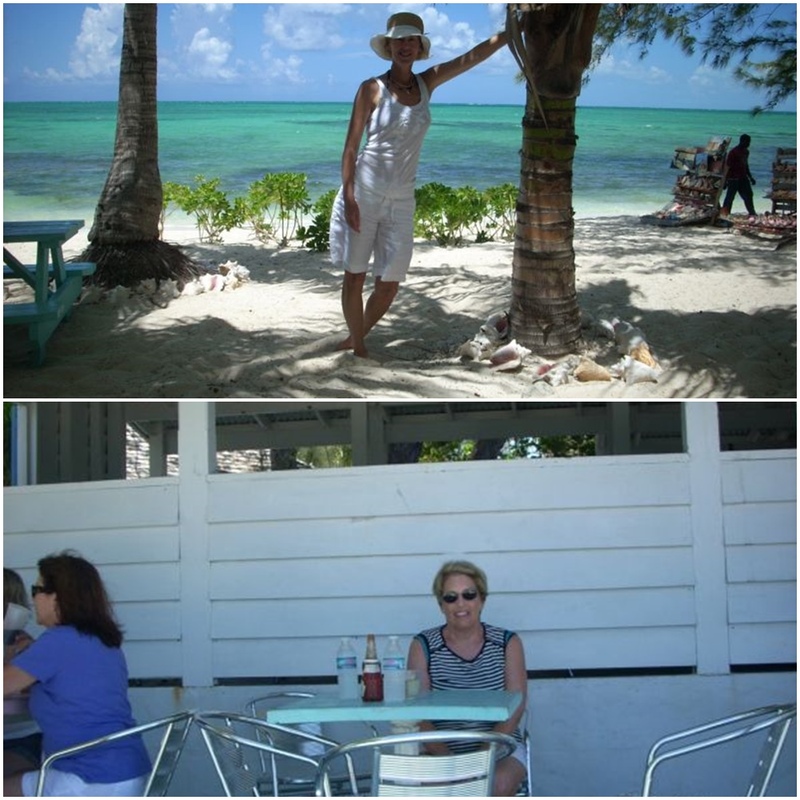 Providenciales, Turks and Caicos. Website and accolades: Click HERE! Three choices, the grey pirate one is ladies L (actually seems smaller), one white, ladies XL... and another ladies L, both slightly better quality than the grey. An off the wall giveaway and don't expect glamour here. 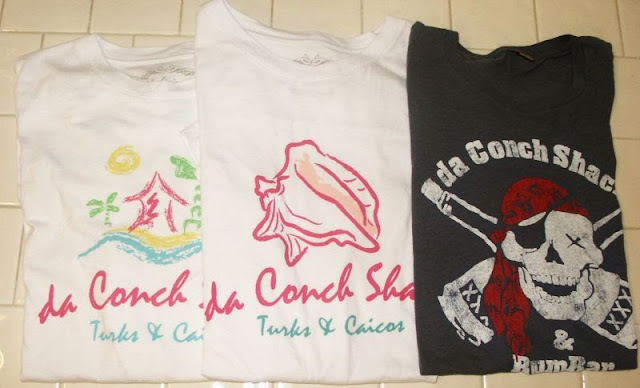 They are new, but were on a shelf in da Conch Shack after all. Let me know if you want to be included in the draw. Not everyone's cup of tea, I know. :) U.S. only. I've been trolling Pastry Studio's blog again. I love her recipes! There were two tempting sandwich cookie recipes in her older posts and here's the first. Now don't think this is a cookie only for kids just because it's pb&j. Not so. The peanut butter flavor is oh so delicate, in fact the entire cookie is perfect for a tea. At least that's how I'm going to serve both her cookies. I made half a recipe to try and will do the same to the second. I'll keep you posted on the other one. And BTW: you can serve them just as single cookies without the jam. Every bit as pretty and tasty. There's no doubt the best presentation for this post is a cookie with a bite out of it, just the way Pastry Studio did it. That way you can see the jam...and you can just imagine how the mouthful tasted. Doesn't even look like a pb cookie, does it? But take my word for it, these are peanut butter and very classy cookies indeed, despite the common name. In a processor, add the flour, powdered sugar and salt. Process briefly. Dice the cold butter and add the butter plus the peanut butter to the flour. Process until you get coarse meal. The add the egg yolk and vanilla and process until the dough begins to clump around the center of the machine. Place the dough in a ball on wax paper. Cover with another sheet of wax paper and roll out to approximately a 10 inch square. Put on a sheet pan and refrigerate until well chilled. Preheat oven to 350 degrees. Line two baking sheets with parchment paper. Remove the cookie dough from the fridge and using any shape cookie cutter you wish, cut and place on prepared cookie sheets. Bake until the edges just start to brown, about 12 minutes, rotating the baking sheets halfway through. Cool. Chop the chocolate into very small pieces and place in a small heatproof bowl. Add the butter and you can melt over a water bath, or use a microwave in 30 second increments until the chocolate and butter are melted. Give a good whisking. Dip a portion of half the cookies in chocolate and set on a wire rack to dry. Spread the other half of the cookies with your favorite jam and sandwich the cookies together. Pastry Studio warns they may soften a bit after you sandwich them together, so serve as soon as possible, or do the sandwiching right before you serve. Welcome to Ina First Fridays....September is salad or soup. Still a bit hot in S. Florida for soups, so I went with this old family favorite. And I have to add....sorry Ina, but my mother was making this salad while you were still in school! :) I ate it as a child and I bet all of you did too. So I'm combining recipes. Basically, it's my mothers, but (just to make this legal) I used Ina's vinaigrette. 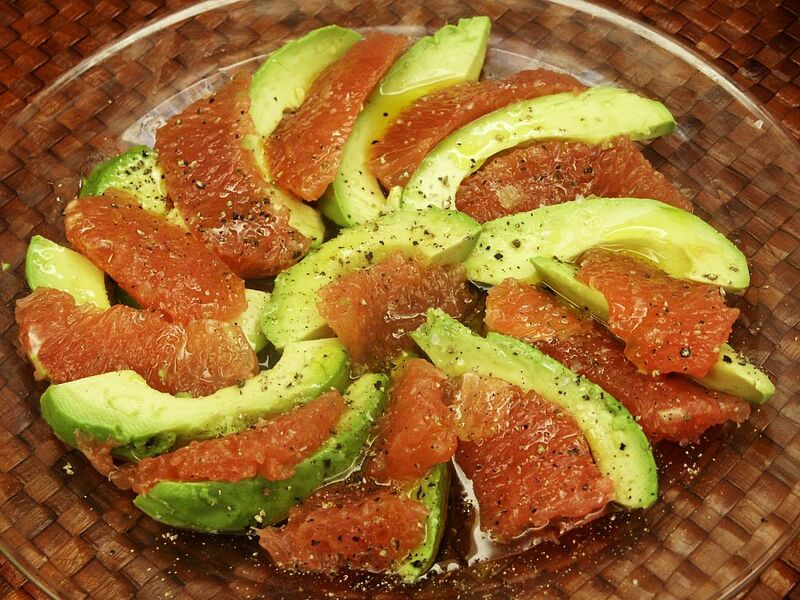 It's a beautiful bright salad, love it with red grapefruit, a perfect first course, looks wonderful on a buffet table and is a super lunch. Can't think of a better way to 1) celebrate our return from vacation and 2) celebrate the arrival of September (do you believe?!!) than to post a Marion Cunningham apple recipe. Put 3 bowls on the counter. In the first, mix the apples and sugar. In the second, mix the eggs, oil and vanilla. In the third, mix the dry ingredients. Stir the egg mixture into the apple mixture. Sprinkle the flour mixture over that and, using your hands as this is a stiff batter, mix well. Sprinkle the raisins and nuts over the batter and mix until they are evenly distributed. 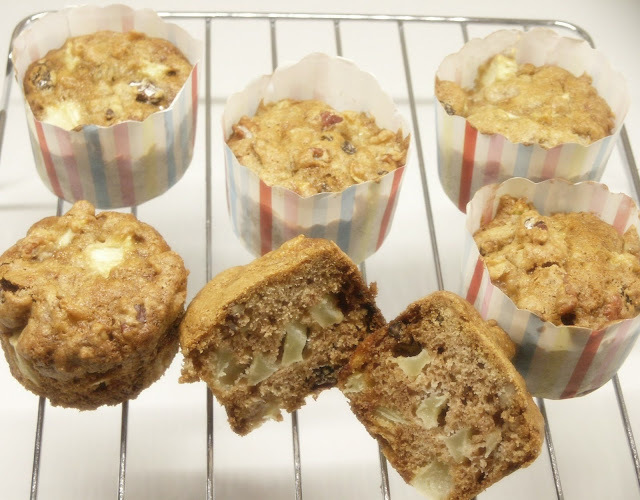 Spoon into the muffin cups and bake about 25 minutes, or until a cake tester comes out clean.